The director's cut of 54 hit blu-ray today...at last. Read our review. What do you get when you take a dark, gritty drama with some queer themes at its core and have it recut by tone-deaf studio execs who are uncomfortable with both its darkness and its queerness, and want a poppy, safe, and marketable heterosexual hit? You get the 1998 bomb 54, which went from Oscar buzz to forgotten flop faster than its characters could snort a line of coke. It was clear before the film even hit theaters that it had been severely compromised from writer/director Mark Christopher's original vision, and the widespread knowledge that the film had been tampered with just further contributed to its cold reception from critics and audiences. But as it turns out, the version released by Miramax in 1998 wasn't just compromised... it was a completely different film from the one Christopher shot. Nearly half of 54 wound up on a very cluttered cutting room floor, replaced by reshoots mandated by the Weinsteins that utterly declawed its filmmaker's vision. But now, in a near-unprecedented tale of cinematic redemption, the long-lost director's cut of 54 is available for us to experience at last, currently available on-demand while it tours the festival circuit. Rarely has a director's cut ever been this different from the theatrical version, and rarely has a commonly-agreed-to-be-bad movie been so fully exonerated as a really good one that was merely a victim of studio sabotage. Only in the broadest sense is this director's cut even about the same thing as the version we've previously seen. It is still the tale of a star-struck young guy (Ryan Phillippe) who gets a job at New York City's legendary night club Studio 54 in the late-1970s, and gets caught up in the excesses of its hedonistic world. But the emphasis, tone, themes, and even the specific subplots and character arcs are completely different. In the brutal cuts and reshoots forced upon the film by Miramax, the film was drastically dumbed down and its darkness was glossed over to supposedly increase mainstream appeal. The plot became shallow and superficial, and the characters became cliché and uninteresting as they were turned into very different people. Whole plotlines were removed and replaced with new studio-dictated ones, and the film was burdened with cheesy voiceover narration and an even cheesier too-happy ending. But perhaps worst of all, the queer themes that were crucial to the film's heart and soul were removed almost entirely, and Phillippe's main character was changed from bisexual to straight because the studio thought that viewers weren't ready to like a bi protagonist. The film was quite literally forced into the closet. What is so immediately striking about this director's cut is that it excels in exactly the areas in which the theatrical version is usually criticized of failing. While the Weinstein cut willfully lost the courage to look much past the superficial glamor of Studio 54, this version is all about exploring the cold emptiness and existential angst behind that façade. In the beginning the film and the audience are allowed to share the awe-struck wonder with which Ryan Phillippe's Shane experiences the club's intoxicating decadence, but it is not long before we start to see the cracks forming. The film isn't as interested in the decadence of Studio 54 as it is the desperation that it masks – after all, right outside its shiny doors was a world of political unrest and economic strife. The club is a fantasy land where characters go to try and silence the anxieties and fill the voids in their lives, but it is all only self-medication. Far from the nostalgic trip to the '70s that the Weinsteins wanted, Mark Christopher's vision has much more in common with 1998's other exploration of the grim underside of that decade, Boogie Nights. out of this money, baby." Christopher's version of the film is equally driven by a great attention to character, as the new 45 minutes of character development gives us a cast of complex, flawed individuals. While in the theatrical cut Ryan Phillippe was accused of being little more than eye candy, here he is a compelling protagonist whose journey into the dark world behind Studio 54's glamor is extremely engaging. As we see his naïveté melt away and his character flaws start to multiply, he brings a humanity to the troubled role that keeps us feeling for him. Yes, he still provides the eye candy, let's be honest, but this time it's in addition to being a very strong lead. Salma Hyeck and Breckin Meyer likewise have far more fleshed-out roles – especially Meyer, whose character was, like Phillippe's, fundamentally changed by the reshoots and recuts into a totally different person. 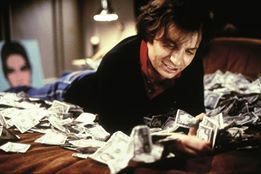 But just like in the previous version, the show-stealing performance belongs to Mike Myers, who proves just how talented he is in his first dramatic role. Playing real-life Studio 54 overlord Steve Rubell, Myers gained some serious Best Supporting Actor Oscar buzz in the build-up to the film's release... only to have his bid for dramatic credibility tank with the film. What a shame, though, because this is the sort of great role – like Jim Carrey in Eternal Sunshine or Steve Carell in Foxcatcher – that should have opened the door to a whole new career path for the obviously talented and versatile comic. Looking bleary-eyed at his world through a drug-induced haze, Myers' Steve Rubell is a complex figure who masks a deep sadness behind all his lecherous behavior and partying. Part demigod of disco excess, part pathetic loser, there's a whole lot more to his character – and Mike Myers' surprising performance – than meets the eye. If this was the version of the film that had been released in 1998, he would have gotten that Oscar nomination. Now before we get to the technical aspects of this director's cut presentation, let's step back for a moment and look at a sad reality of film in the 1990s. This was an era when DVD was an extremely young medium, and deleted scenes were a rare and not at all expected special feature (back then, the usual special features were just a trailer and “interactive menus,” you may recall). It was also a time when home video director's cuts and unrated versions were extremely uncommon, and only very popular or well-respected films like Blade Runner and Apocalypse Now got them. So it was pretty standard for studios to think that unused footage from films was pretty much worthless, and throwing such material in the trash happened more that we would like to think, making some much-requested director's cuts (like, notoriously, Event Horizon) impossible. I bring up this historical context so you understand why you should be forgiving of 54: The Director's Cut when I tell you that the picture quality is noticeably uneven. For the most part, it looks great: this film was extremely lucky, and most of the 45 minutes of missing footage survived as either negatives or good quality prints from test screenings, and all of this material was lovingly remastered. But there are a handful of sequences (not many, but enough) that did not survive as either negatives or prints, but only on digibeta transfers: better than VHS quality by a long shot (no color-bleeding, and it upconverts to HD pretty well without too much softness), but unquestionably from an SD source. But don't worry, it doesn't look like a bootleg or a leaked workprint or anything like that: it was remastered as perfectly as could be hoped for, and it looks extremely good for the circumstances, with the different sources blended as seamlessly as possible. Just keep that historical context in mind and realize that we are really, really lucky that as much survived on film as it did, and it's pretty much a miracle that Mark Christopher could even get his hands on these elements to put this director's cut together. All other aspects of the presentation are great: the audio mix is excellent, and Christopher totally redid the color correction and contrast to create a darker, moodier aesthetic than that of the theatrical version. Ryan Phillippe even came back to record a new opening-sequence voiceover, to replace the lame narration he was forced to do the first time. With 54, Miramax took a really good movie and screwed it up. Their decision was proven to be a really stupid one almost immediately: not only did their altered version bomb, but two other films that same year showed that the studio's fears about its content were totally unfounded. Todd Haines' Velvet Goldmine was a popular success that became an enduring cult classic, and its queer themes certainly did not scare the mainstream away. And Paul Thomas Anderson's Boogie Nights came to be regarded as one of the year's finest films (and one of the crowning achievements of the filmmaker's career) with exactly the sort of dark, gritty look at the 1970s that 54 was supposed to have. Sure, 54's frank bisexuality may have been boundary-pushing in 1998, but I think Miramax overreacted when they said it would have been too much for 90s audiences to accept. In today's comparatively much more LGBTQ-friendly world, nothing in the director's cut should be terribly shocking, but it's great that the film was finally allowed to come out of the closet. With 45 minutes of new footage – and more importantly, the removal of 35 minutes of compromised footage – 54: The Director's Cut is a film you have never seen before, whether you have seen the theatrical version or not. With such strong attention to character and themes that it never had before, and with a much darker and more critical outlook, it packs a punch that would have stunned and invigorated audiences in 1998, and is still really good in 2015. The closing credits end with “special thanks to Paul Schrader,” whose quintessential gritty 1970s films helped inspire Mark Christopher's vision – and this time around, the homage fits with the film that precedes it. Watch this new version on demand, or if you're attending a festival that is screening it, go see it: this is a film that really deserves its redemption, and hopefully it will find it now.